Use Canva’s stunning templates and intuitive design tools to create custom WhatsApp Status posts quickly and with ease. When it comes to communicating with your friends, an interesting image can say a thousand words. Whether you create quotes, funny memes or inspirational messages, designing in Canva will help your WhatsApp status to pack a punch. Adorn your imagery with drawings, striking captions, design elements and more – stay ahead of the curve with statuses that communicate your own personal style. Even with little to no design skills, you can easily create professional looking graphics with Canva. All you need to do is pick one of our templates, which are all created by in-house graphic designers. Once you’ve got the template that you like, it’s just a matter of personalizing the design to make it truly your own. Create a new Canva account to get started with your own WhatsApp Status posts. Customize and personalize a template to suit your taste and style. With Canva’s intuitive interface and easy to use platform, you have complete control over the look and feel of your designs. Choose from hundreds of fonts to suit and enhance your message, or pick any color you like from Canva’s full-spectrum color wheel to appeal to your own personal style. Move graphics, lines, icons, shapes and more by simply dragging, resizing and dropping where you want them. You can even apply filters to your images to create warm, monochrome or antique effects. Looking for a specific kind of image that you can’t take with your phone? Browse Canva’s extensive image library of over 1 million stock photos and illustrations to find something that suits your design. Each image is carefully reviewed before being included into our library by the Canva team, so you can be sure that you’re dealing with amazing imagery that will help your designs to look their best. Canva’s image library is sure to have something for everyone and we pride ourselves on giving people the ability to create professional designs for free. And even if you want to use a premium element, it’s never going to break the bank. All of our premium images and elements are priced at only $1 a pop so you can always design a striking Whatsapp Status with Canva even on a budget. 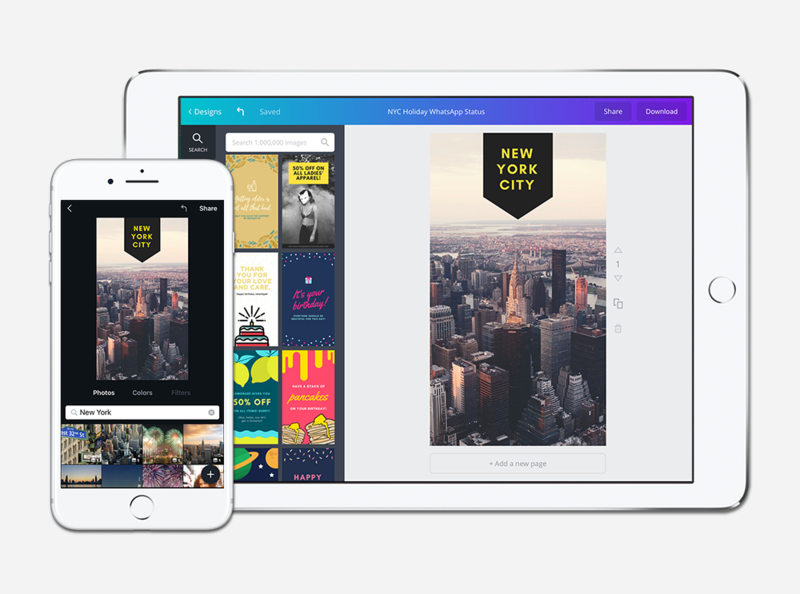 Whether you use the Canva app or access our platform on your computer, designing and then exporting your designs for your Whatsapp Story couldn’t be easier. After designing, tinkering and captioning your image to your liking, you can easily export it by hitting the Download button. You can opt to download your design as an image so that you can upload directly to WhatsApp to share with your friends. And if your friends really like it, you can easily share or email as an editable design to give anyone the ability to rework your masterpiece to make it their own. Yes! You can create an account for free by heading on over to www.canva.com. Our iPhone, iPad and Android apps are also free to download from the App Store and Google Play. Plus, using our layouts library to create WhatsApp Status posts is completely free. There are also a large range of free images to choose from, otherwise all premium photography in our stock library is all priced at just $1. There are no other fees to use Canva. There are watermarks on my WhatsApp Status design; how can I remove them? Where can I find inspiration for my WhatsApp status? Our library is packed with awesome examples of WhatsApp status designs created by professional designers. If you’re stuck for inspiration, these layouts are a great place to start!